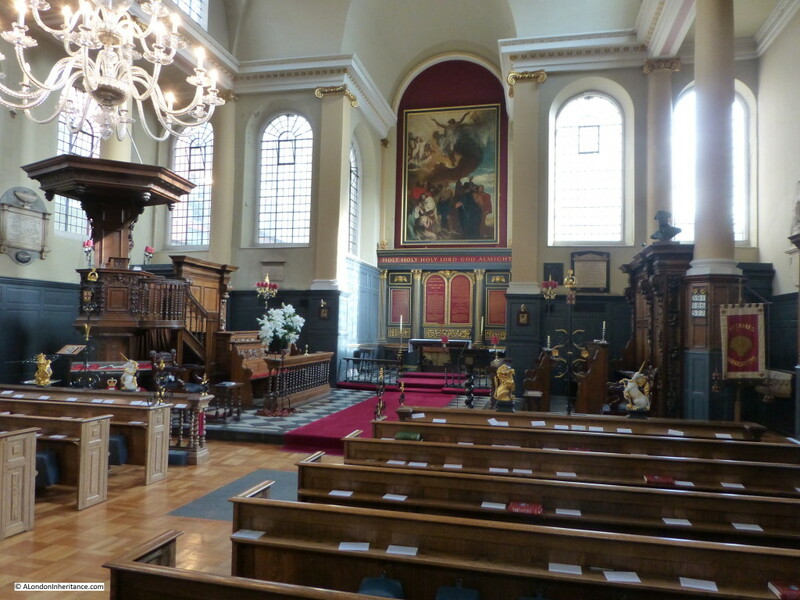 This week, I am visiting the Wren church of St. James Garlickhythe on Upper Thames Street. 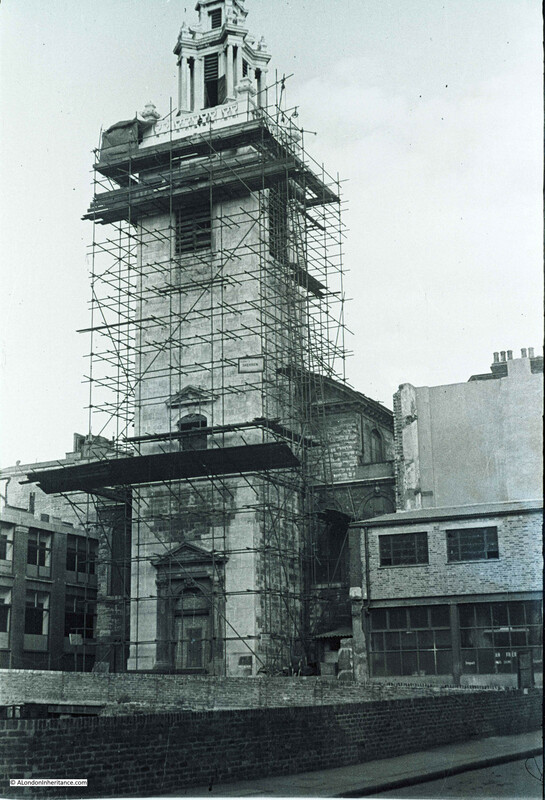 The following photo was taken just after the war when repairs were taking place to the tower. 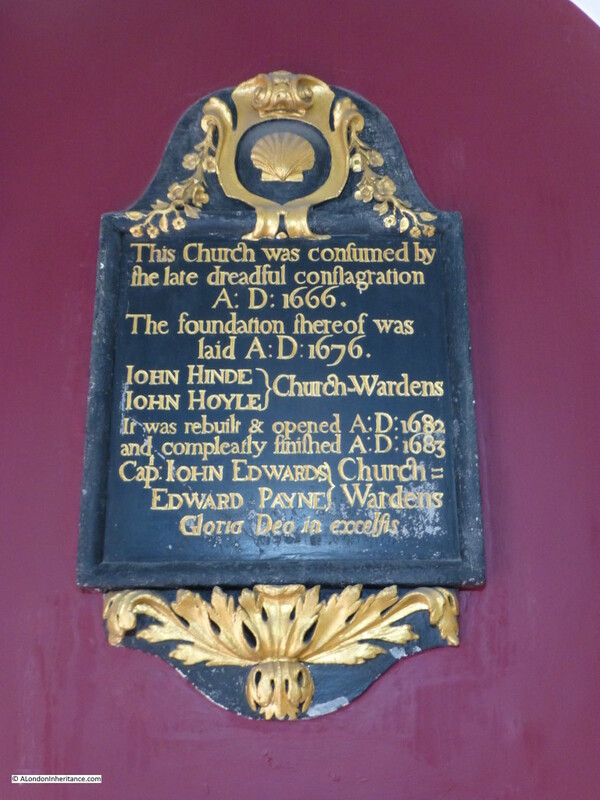 St. James did not suffer major damage during the bombing of London unlike so many other of Wren’s City churches. There was some damage to the tower, including the loss of the original 1682 clock that stood out from the tower, and a very lucky escape when a 500lb bomb fell into the church but failed to explode. The church today is much the same, however the surroundings have changed considerably with the church now right up against the considerably widened Upper Thames Street. 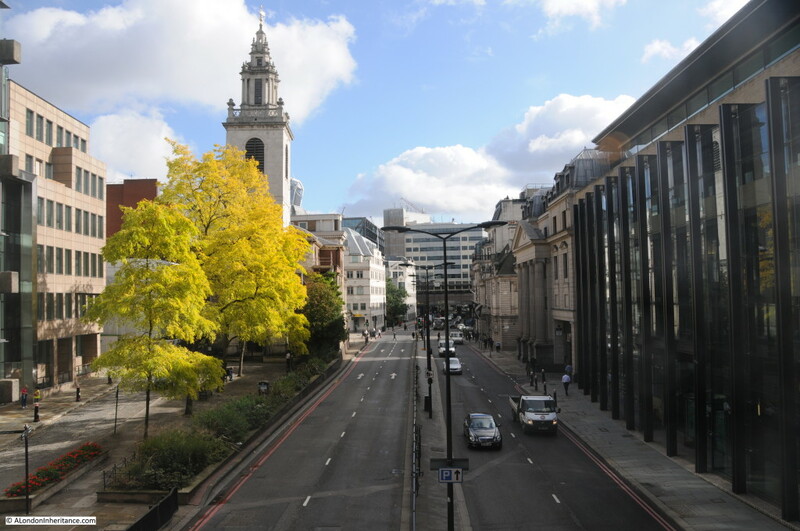 The buildings to the right of the church in the above photo were destroyed to make way for the extra lanes as Upper Thames Street was widened from a single road to dual, two lanes of road to carry traffic between the east and west ends of the City. Although now up against Upper Thames Street, the church is on Garlick Hill. The church is dedicated to the apostle St James, and the Garlickhythe part of the name is from “hythe” being the Saxon word for a landing place or jetty, with Garlick coming from, as explained in Stow’s Survey of London for both church and hill, “for that of old time, on the banks of the river of Thames, near to this church, garlick was usually sold”. 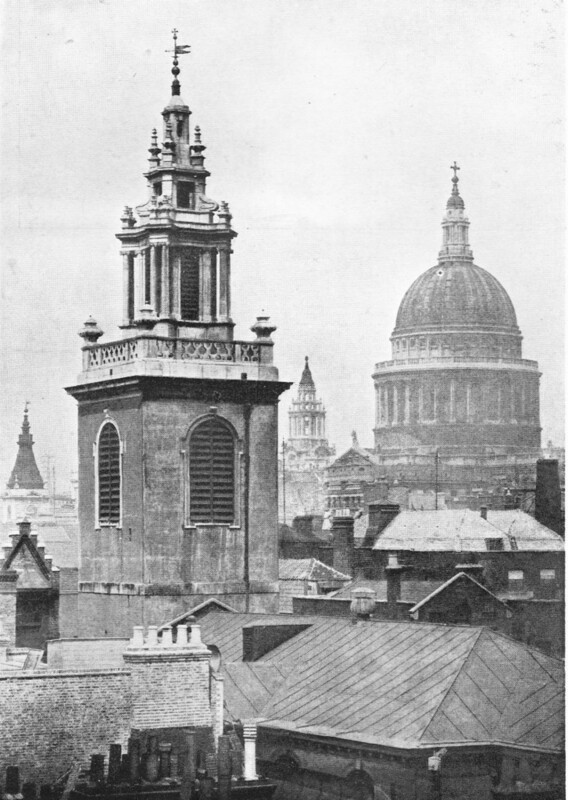 A pre-war view of the tower and steeple of St. james Garlickhythe with St. Paul’s in the background is shown below. As was typical of the pre-war city, the steeples of the City churches stand well above the surrounding buildings which cluster close around the church. Among the monuments Inside the church, there is one of the saddest I have found in a City church. Whilst we may romanticise about the London of centuries past, the lost buildings, streets and ways of life, London was a hard place to survive and raise a family. 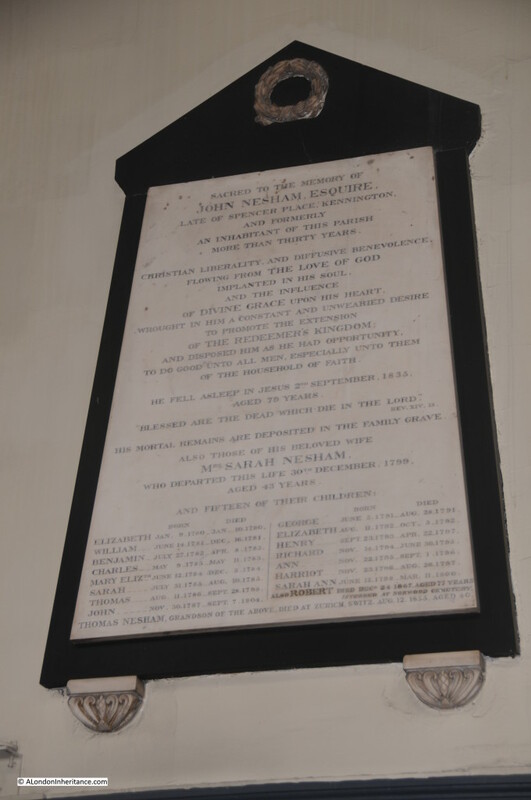 The following monument records the Nesham family who lived in the parish for more than 30 years. 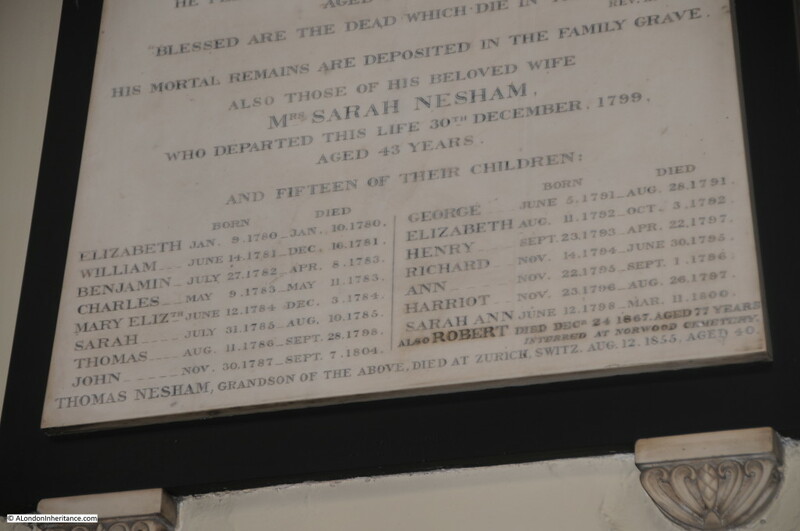 Sarah Nesham lived to the age of 43, “departing this life 30th December 1799”. The monument also records the death of fifteen of their children, the majority of whom did not reach the age of one, with the oldest of the fifteen making it to thirteen. A sixteenth child was added later, Robert had reached the age of 77 when he died in 1867, one child out of sixteen living past their thirteenth birthday. The detail of the children are shown in the following photo. One can hardly imagine what Sarah must have gone through in her 43 years, and I am sure that whilst fifteen children may have been the exception, this high level of child mortality was not unusual in London in the 18th Century. It would also be interesting to know what their Grandson (presumably by their one child Robert surviving to adulthood) was doing in Zurich when he died in 1855 at the age of 40. The nave of the church is one of the highest in London, large windows provide a very light interior. Up until the war the church had stained glass windows which must have resulted in quite a dark interior. The use of plain glass in the restoration of the church allows light to stream into the interior. Behind the altar is the 1815 painting of the Ascension by Andrew Geddes. Up until around 1808 there was an open churchyard in front of the church, after this time it was enclosed by iron railings. 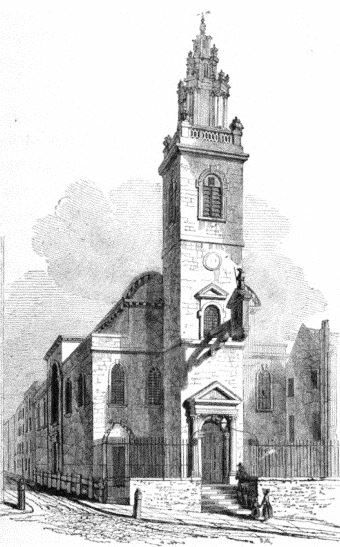 The picture to the left shows the church as it appeared in the 1830’s, looking much the same as now, with the railings at the front and the clock on the tower. The clock was one of the victims of damage sustained by the church during the war. 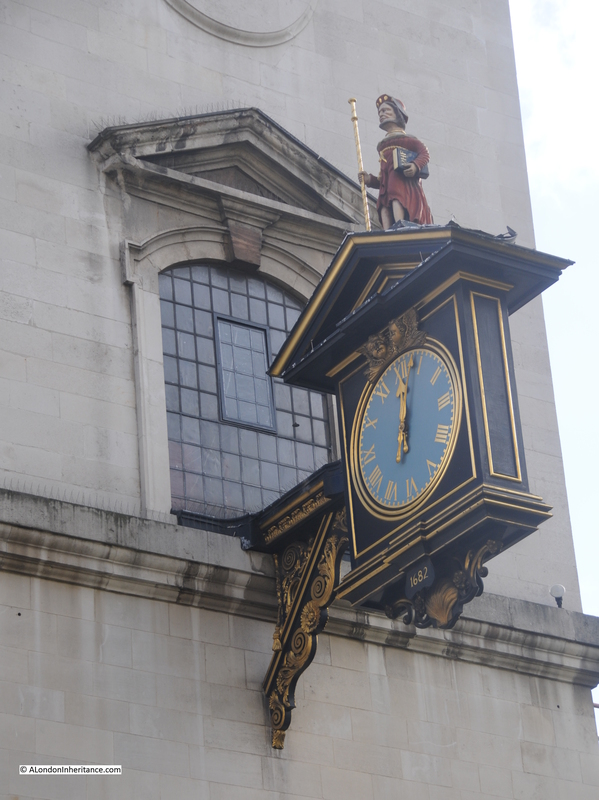 A restored clock was installed in the same position which is shown in the photo below. 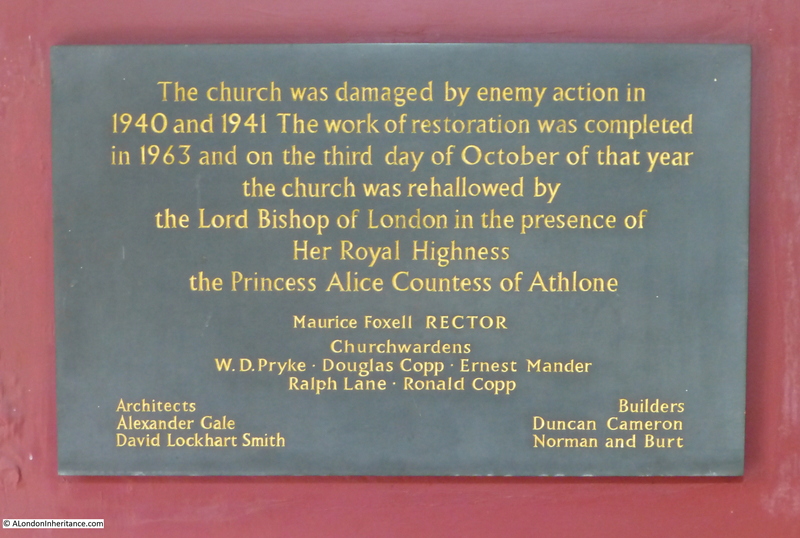 The church is associated with many of the City Livery Companies, including the Vintners’ Livery Company who contributed considerably to the restoration of the clock. 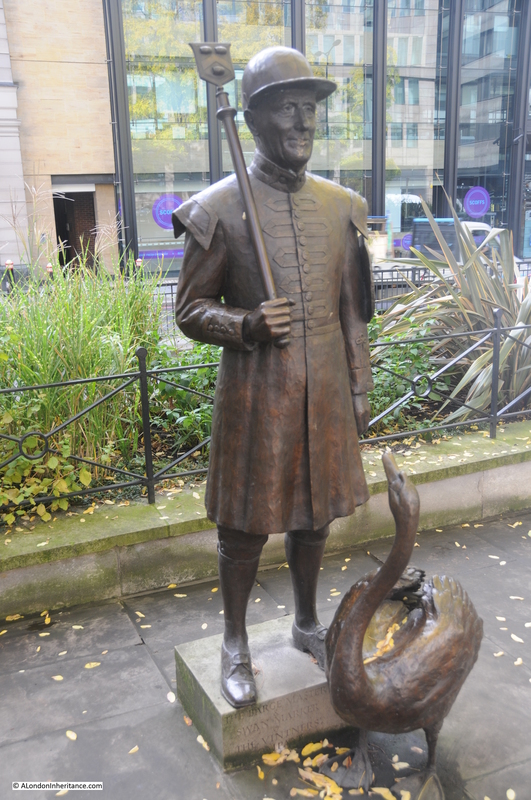 In front of the church is a small statue of the Barge Master and Swan Marker of the Vintners. The Vintners have held the right to own swans for many centuries and continue to hold the annual Swan Upping to count the swans on the Thames. 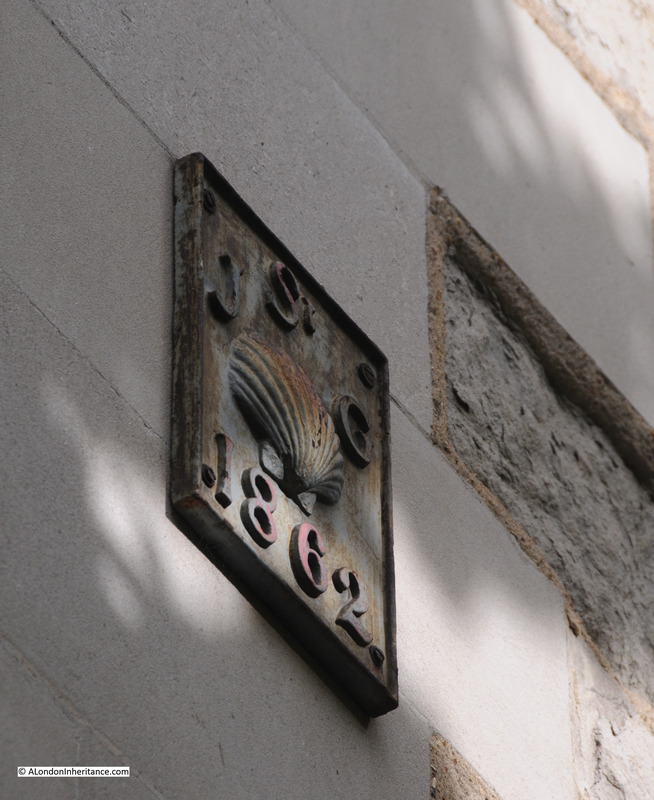 The Scallop Shell is the symbol of St. James and there are many shell symbols around the church including the one shown in the photo below on the exterior of the church. We can see how the area around the church has changed by walking across the footbridge over Upper Thames Street. Originally Upper Thames Street was just the two lanes on the right of the photo. The lanes on the left were buildings that faced onto Upper Thames Street. reconstruction after the war and the need to provide routes through the City between east and west resulted in the considerable widening of this road, which took the boundary of the road right up against St. James Garlickhythe. As with all the City churches, St. James Garlickhythe is well worth a visit and when there spare a thought for Sarah Nesham and her fifteen children. Life was extremely tough and challenging for so many during London’s long history. St. James Garlickhthe is opened regularly by the Friends of the City Churches. 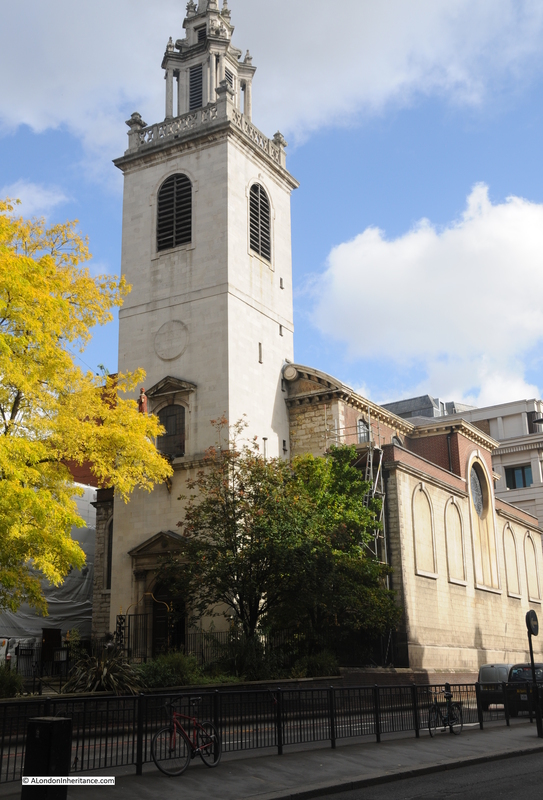 This entry was posted in London Churches and tagged St James Garlickhythe on November 16, 2014 by admin. Thanks for the comment. Regularly read your blog as well. Very enjoyable blog. I shall have to add St.James to my long list of ‘to visit’ places,along with the memorial to Sarah, poor lady! Doing research & trying to find out about my family & so thrilled to stumble across your article. Thank you!